For the unincorporated community in Mahoning County, see New Albany, Mahoning County, Ohio. 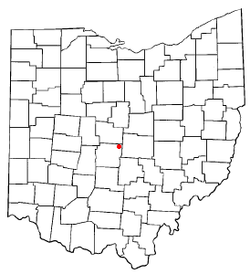 New Albany is a city in the U.S. state of Ohio, just northeast of the state capital of Columbus. Most of the city is located in Franklin County and a small portion extends into adjacent Licking County. The population was 7,724 at the 2010 census. Founded in 1837, it is now a growing suburb in the Columbus area. New Albany is a very wealthy community, with a per capita income that ranks 12th out of 1,065 places in the state of Ohio. The mayor of New Albany is Democrat Sloan Spalding who was elected in 2015. New Albany is located at 40°4′43″N 82°49′14″W﻿ / ﻿40.07861°N 82.82056°W﻿ / 40.07861; -82.82056 (40.078643, −82.820618), northeast of Columbus at an elevation of 1,024 feet (312 m). According to the United States Census Bureau, the village has a total area of 11.70 square miles (30.30 km2), of which 11.56 square miles (29.94 km2) is land and 0.14 square miles (0.36 km2) is water. New Albany is situated in the headwaters of the Rocky Fork Creek, a tributary of the Big Walnut Creek. The Rocky Fork Rose Run and Rocky Fork Sugar Run meander throughout the city. Blacklick Creek runs through the eastern end of the city. The land that was to become the city was founded in the center of Plain Township in 1837 by Nobel Landon and William Yantis. Land was split into lots measuring 50 ft (15 m) by 100 ft (30 m) and sold to new settlers. One theory about the name "New Albany" is that some of the original settlers migrated from the Albany, New York area. During its history, the community has also been known by the name of "Hope." In 1856, New Albany was incorporated with a population of 50, and the first mayor (S. Ogden) was elected. The Wilkins Lumber Mill, later renamed the New Albany Mill, opened in 1881. In 1922, Mrs. Edward Babbitt was elected the first female mayor of New Albany. In 1970, New Albany was much smaller than it is today, only consisting of a small part of Plain Township that did not even touch Columbus. The first annual New Albany Founders' Day Celebration was held in 1976. As late as 1980, the census only listed 414 residents in the village. 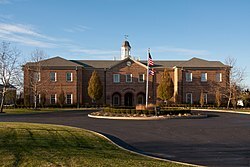 Rapid growth in New Albany began in the 1990s, much due to the expansion of the Les Wexner clothing empire and Wexner's construction of his mansion (the 2nd largest in central Ohio behind the Longaberger mansion) off Kitzmiller Road in the village. State Route 161 and access to 161 from I-270 was reconfigured around this time, allowing freeway access into and out of town. In 2008, the New Albany Mill closed 119 years after its downtown opening. The original sawmill had been converted to a hardware store, and was a staple in the lives of many of the residents of New Albany. The 2009 Fathima Rifqa Bary controversy occurred in New Albany, and made national headlines. New Albany teen Bary (raised Muslim but a convert to Christianity) ran away from home to Florida, claiming that as a convert she feared that she would be killed by her family, a claim her parents called untrue. As of the census of 2010, there were 7,724 people, 2,406 households, and 2,138 families residing in the village. The population density was 668.2 inhabitants per square mile (258.0/km2). There were 2,653 housing units at an average density of 229.5 per square mile (88.6/km2). The racial makeup of the village was 87.7% White, 3.1% African American, 0.1% Native American, 6.5% Asian, 0.1% Pacific Islander, 0.4% from other races, and 2.1% from two or more races. Hispanic or Latino of any race were 2.0% of the population. There were 2,406 households of which 58.9% had children under the age of 18 living with them, 80.6% were married couples living together, 5.5% had a female householder with no husband present, 2.7% had a male householder with no wife present, and 11.1% were non-families. 9.1% of all households were made up of individuals and 2.8% had someone living alone who was 65 years of age or older. The average household size was 3.21 and the average family size was 3.43. The median age in the village was 37.9 years. 36.6% of residents were under the age of 18; 3.9% were between the ages of 18 and 24; 24.8% were from 25 to 44; 28.3% were from 45 to 64; and 6.5% were 65 years of age or older. The gender makeup of the village was 49.6% male and 50.4% female. As of the census of 2000, there were 3,711 people, 1,263 households, and 1,030 families residing in the village. The population density was 415.7 people per square mile (160.5/km²). There were 1,424 housing units at an average density of 159.5 per square mile (61.6/km²). The racial makeup of the village was 94.18% White, 1.56% African American, 0.32% Native American, 2.75% Asian, 0.35% from other races, and 0.84% from two or more races. Hispanic or Latino of any race were 0.81% of the population. There were 1,263 households out of which 46.2% had children under the age of 18 living with them, 75.1% were married couples living together, 4.1% had a female householder with no husband present, and 18.4% were non-families. 15.6% of all households were made up of individuals and 3.5% had someone living alone who was 65 years of age or older. The average household size was 2.94 and the average family size was 3.30. In the village the population was spread out with 33.1% under the age of 18, 4.2% from 18 to 24, 28.6% from 25 to 44, 26.6% from 45 to 64, and 7.5% who were 65 years of age or older. The median age was 38 years. For every 100 females, there were 98.0 males. For every 100 females age 18 and over, there were 97.1 males. The median income for a household in the village was $102,180, and the median income for a family was $119,171. Males had a median income of $100,000 versus $36,563 for females. The per capita income for the village was $62,131. About 1.2% of families and 1.2% of the population were below the poverty line, including 0.5% of those under age 18 and none of those age 65 or over. At the center of New Albany (shaded) three large roads meet: Dublin-Granville, Route 62/Johnstown Road, and New Albany-Reynoldsburg/Route 605/New Albany-Condit. Market Square is in darker red. New Albany has a sizable Jewish population as a percentage of total population, second only to Bexley in central Ohio. New Albany is home to Temple Beth Shalom, the Columbus Jewish Day School, the Chabad Center for a Jewish Tomorrow, and central Ohio's newest Jewish Community Center. In the center of the city, three main roads cross: Dublin-Granville, U.S. Route 62/Johnstown Road, and New Albany-Reynoldsburg/Ohio Route 605/New Albany-Condit. These three roads divide the city into six roughly equal sections. In the southwest section is the New Albany Country Club, much of the club's golf course (designed by Jack Nicklaus), and Market Square. The south-central section contains the remainder of the golf course, with the rest mostly residential. The estate of Les Wexner, the largest in central Ohio, is in the southeast section. The northwest section houses New Albany Schools and the performing arts center. The New Albany Links golf course (designed by Barry Serafin) and the surrounding neighborhoods are in the north-central section, along with Bevelhymer Park and the headquarters of Tween Brands. Lastly, the northeast section contains the Mt. Carmel New Albany Surgical Hospital and the new headquarters of Bob Evans Farms, Inc.. The New Albany Market Square, a popular community gathering place in the center of the city, is home to many businesses, including: Starbucks, Learning Express, New Albany Realty, Rusty Bucket Corner Tavern, and the New Albany Branch of the Columbus Metropolitan Library. Notable companies headquartered in New Albany include Abercrombie & Fitch (part of the retail clothing conglomerate built by New Albany resident Les Wexner, who is also the owner of Limited Brands and many others.) and Commercial Vehicle Group. The former is the leading employer within the city boundaries. On March 10, 2011, Bob Evans Farms, Inc. announced plans to move their corporate headquarters (and almost 400 corporate employees) from the south side of Columbus to New Albany. Construction on their headquarters was completed in 2013. Other employers in the city include Discover Financial Services, Aetna Life Insurance, American Electric Power, UBS, New Albany-Plain Local School District, and the Mount Carmel New Albany Surgical Hospital. Most of the large office buildings housing these employers lie in a corridor between Route 161 and Central College Road to the north. Facebook plans to build a data center in New Albany, expected to be completed in 2019. The New Albany community has shown strong support for the performing arts. Located in the city are the New Albany Symphony Orchestra and the New Albany Ballet Company. In 2002, the New Albany Community Foundation approached the Columbus Metropolitan Library (CML) to see if CML would build a library branch in New Albany if the Foundation would donate the book collections and computers. After a fundraising campaign, the library was built in the Market Square area. Inspired by the success of the library, the Village of New Albany, Plain Township, and the New Albany-Plain Local School District partnered together in the development of the Jeanne B. McCoy Community Center for the Arts, named after the late wife of John G. McCoy and mother of John B. McCoy. The 35,000-square-foot (3,300 m2) brick building (located contiguous to the downtown learning campus containing the district schools) contains a 786-seat auditorium with balcony seating, a rehearsal studio, a dance studio, a scene shop, and classrooms dedicated to the performing arts. Land for the $15 million facility was donated by The New Albany Company. Each May since 1976, New Albany residents celebrate Founders Day with a parade, festival, rides, vendors and street performers. Taste of New Albany is an annual culinary event (each August since 2002) that draws thousands to Market Square in downtown New Albany to sample (for an entry fee) food from dozens of restaurants. The proceeds from this event benefit the New Albany Chamber of Commerce. The New Albany Walking Classic is a 10K walking event held annually in early September in New Albany since 2005. It draws thousands of walkers from the Ohio area and beyond, and had over 2,600 finishers in the 2009 race. The event was named the country's best walking event in 2008 by Walk magazine, and is now the country's largest walk-only race. The New Albany Classic is a USEF/FEI-sanctioned equestrian event held each September since 1998 on the estate of Leslie Wexner and his wife Abigail Wexner, founder of the event. The event raises money for the Columbus Coalition Against Family Violence. The related Family Day has many activities, including a concert, amusement rides, and displays of animals from the Columbus Zoo and Aquarium. Teen band New Hollow is based in New Albany; the members of the band met in New Albany schools. Kiefer Sherwood, an NHL hockey player with the Anaheim Ducks. ^ "New Albany officially certified as a city". ^ "Secretary of State Husted Announces Ohio City & Village Classifications Based on 2010 Census Data". ^ Viviano, JoAnne. "Rifqa Bary Details Transformation from Islam to Christianity". The Columbus Dispatch, 2015-05-20. Accessed 2015-10-01. ^ Data in historical populations table from US Census, 1890, 1891 ; Bureau Of The Census, United States; Austin, William Lane; Teele, Ray Palmer (1921), US Census, 1920 ; Bureau Of The Census, United States, US Census, 1950 ; Bureau Of The Census, United States (1973), US Census, 1970 ; US Census, 2000, ISBN 9781428986060 ; "American Factfinder". US Census Bureau. .
^ "Facebook announces plans for new data center in New Albany". 10tv.com. WBNS10-TV Columbus, Ohio, Associated Press. Retrieved 15 August 2017. ^ Bell, Jeff (2008-07-07). "Sponsors, racers step up support of New Albany Walking Classic". This page was last edited on 15 February 2019, at 04:20 (UTC).